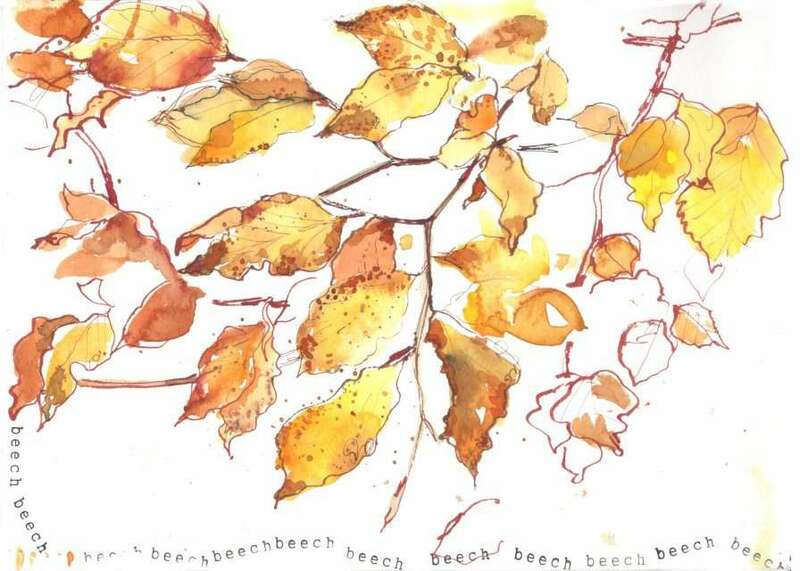 Yesterday I saw some beautiful beech leaves that I wanted to paint. There was something so magical about them. The colours, the hues…I don’t know. I did try to go out and paint – I had been stuck in front of a screen all day – but God had other plans. He was clearly saving up clouds (for a rainy day, lol) and you can’t paint in pouring rain. Reuben the terrier and I had to run for cover within a minute. So I painted this nice apron instead, a gift from my wonderful friend Lorraine. 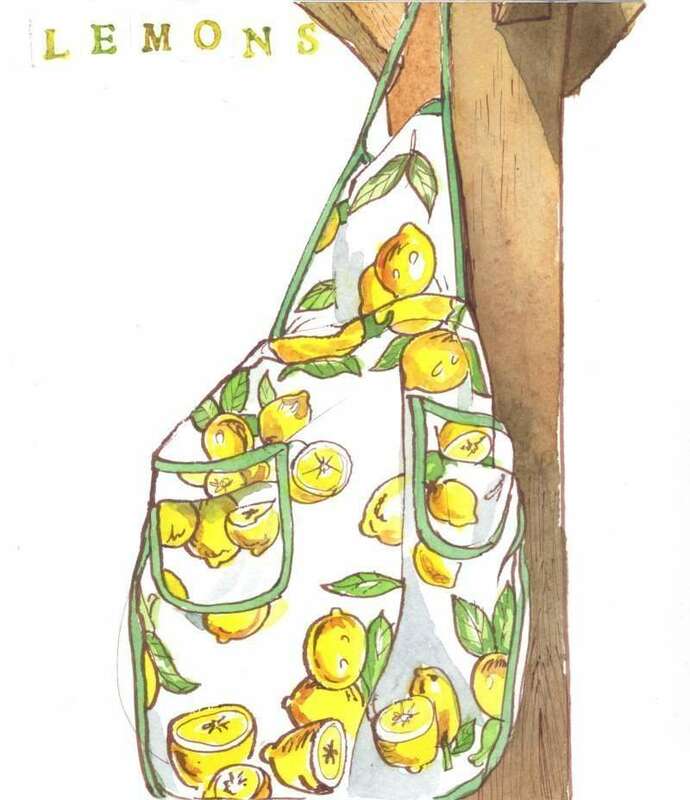 When life gives you lemons, paint the apron they’re printed on, as the old saying doesn’t go. I always feel better for a sketch and painting the apron made me feel GREAT. Afterwards, I went to the early show of First Man with my husband Marcel and had a nice snooze in the middle. There was nothing whatsoever wrong with the movie, it was really well made and was very evocative of the period spanning 1962 to 1969 when – spoiler alert – the first man walked on the moon, but I wasn’t on the edge of my seat, so to speak. Maybe I was distracted: there was the usual sort of teenage drama going on back home, and my phone kept vibrating in my pocket: I wanted to know if anything serious was going down (not that I was checking it, so all I achieved was enjoying the movie less). Still, I know the story of man’s trip to the moon is amazing and everything – truly astonishing that humans did that – but there is a large part of me that doesn’t get why you can’t be content with just looking at the moon. Lorraine and I are off to the cinema on Thursday…Call Me By Your Name…more to our taste, I suspect! Today it wasn’t raining. Out I went with Reuben. We don’t have a gate at the bottom of the drive and I’m always worrying that Reuben will run onto the road, even though there’s very little traffic. But he never does. I always know exactly where he is and besides, he follows me like a shadow. Today he sat on the drive and wagged his tail, and it was so clear – as it always is with dogs – that he was saying “What do you want me to do?” I put him on the “lawn” (the inverted commas are there because it hasn’t been mown for five months or more) on the left of the drive, and started sketching leaves on a beech tree on the other side. He mucked about happily for the half hour or so that I sketched, barking at rooks, gnawing sticks and growling, pulling up grass with his teeth (no need to mow at all now!) and generally having a great time. I scribbled away in brown and red ink, and splashed Cadmium yellow and Venetian red paint around and I generally had a great time. Happy Reuben, happy me. My philosophy as an art teacher is threefold. Top of the priority list is that they leave class feeling proud of themselves, and that they learn to identify as being “good at art”. This is so that as they start to navigate the stormy waters of adolescence, they will be able to retreat into the joy of visual creativity. It’s a valuable part of their growing-up toolkit. Second, I want them to enjoy the class and have a great time (years ago, one of the mums told me that not being allowed to go to art was used as a threat to her three beautiful daughters. Definitely a high point as a teacher!). Third, I want the kids to become really good at drawing and painting. I teach straight up watercolour: lightest colours first, nice brushwork, all the things I teach adults but on a simpler level. (That’s another way of saying I just tell them to do it, and they do it. Adults are slower to give me their trust…) Anyway, I haven’t taught kids since June, because I had too many things vying for my attention. But I’m really happy to be back: I love those little people. The last thing I did today was go around and ask them about their pets. They talk about them in such a funny way, and so fresh. “I had lots of fish, but they kept dying, so I don’t have anything now,” said one. “I have bunnies, but my dad is allergic,” said another. “I have three dogs, two cats, a hamster and two fish,” said another girl. “And she has lots of hens!” chimed in another. Clearly fell under the heading “pets”. But they were so animated talking about their animals and their hands were shot straight up, the children bursting to tell me about their pets. Communion with animals is so fundamental to children. Many of my memories from early childhood are a bit hazy, but I remember the cats and dogs we had so clearly. Fish, not so much. 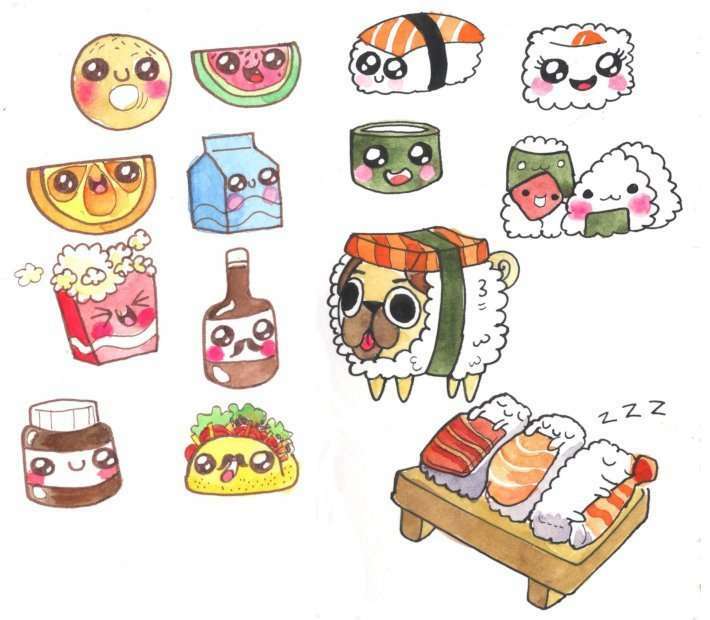 If you have an artistic child in your life, get them to draw some cute Japanese-style animals – they’ll love you for it!